Please note that all parking spaces are allocated - do not park in the car park without a permit. Occupying a prominent position set back on the west side of Hanger Lane, at the junction with Greystoke Gardens and virtually backing on to Hanger Hill Park. Only a short stroll to Hanger Lane (Central Line) station and Park Royal (Piccadilly Line) station which provide quick and easy access into Central London. The A40 close by provides quick access into Central London via Westway and westwards towards Oxford and the Midlands via the M40. Ealing Broadway, located about one mile and a half to the south west, provides multiple shopping facilities and frequent train service to Heathrow. Ealing Broadway station is due to be redesigned to accommodate the new Crossrail service from Essex/Kent via the City, West End and Paddington to Heathrow and Maidenhead. Greystoke Lodge was built in the 1950s by the Prudential for their employees. In 1986 the Prudential developed the west part of the site for houses, refurbished and converted the flats in Greystoke Lodge and sold the majority of these on the open market. A resident's management company called "Greystoke Lodge Limited" was set up in which all the lessees hold a share. Greystoke Lodge consists of a very substantial mansion style development arranged principally on five floors and designed in a "T" shape with 40 flats accessed via the main entrance and two additional flats with their own separate entrances at the site and the rear of the building. Constructed of brick with a pitched tiled roof, the building is designed with a part rendered bay fronted elevation and a smart pillared entrance lobby leading into an exceptionally large entrance hall, wide staircase and vast landings on the upper floors. A panelled passenger lift is featured, the entrance hall, stairs and landings are carpeted and a video entry-phone system is installed. The building has a car park at the front, in which spaces are available to rent. Wonderful secluded mature gardens to the rear laid to lawn into mature shrubs, borders and surrounding trees. All flats are held a lease for a term of 125 years from 25th December 1986. 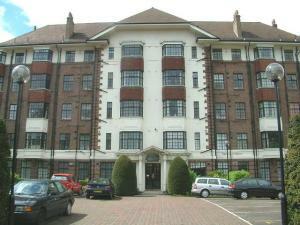 The residents management company, in which all the lessees have an equal share, owns the freehold interest.